How Bad is Smoking when Trying to Conceive? Don’t get it twisted: When you’re talking about smoking and fertility, it’s not just the ladies that need to lay off of the smokes- the guys do too! For the boys, smoking can damage the quality of sperm, and can also lead to lower sperm counts. Ladies, smoking while trying to conceive can make conception take longer. It can also contribute to hormonal imbalances, which can lead to conception problems. Another alarming fine? 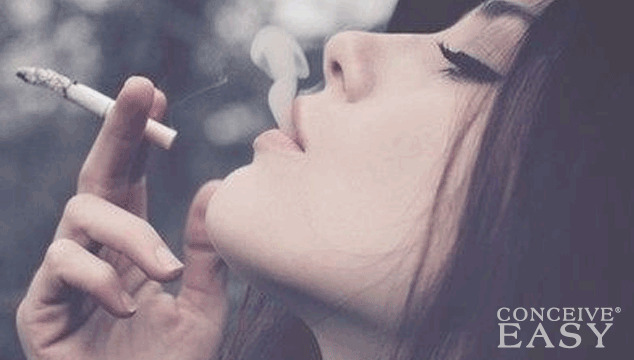 Smoking can even bring on early menopause in women!! If you are trying to conceive, this is a huge deal! There really are no exceptions to the rule: If you want to get pregnant and you smoke, QUIT! If your partner smokes, he or she needs to quit too! Doctor’s orders! As you might imagine, if smoking while you are trying to conceive is so bad for you and so frowned upon, smoking after you actually do get pregnant is even worse! Women who smoke have an increased risk of having an ectopic pregnancy or a miscarriage. Smoking while pregnant also increases the risk of premature birth, low birth weight and SIDS. Of course, we all know the dangers of secondhand smoke, and those effects are even worse on a newborn. If you smoke or your partner smokes, focus on quitting. Ask your doctor for tips if you need help kicking the habit, there are many alternatives and options out there, if you really put your mind to it, your smoking habit will be just a distant memory!